C&Cnet client screen resolution bug plus mods using it. 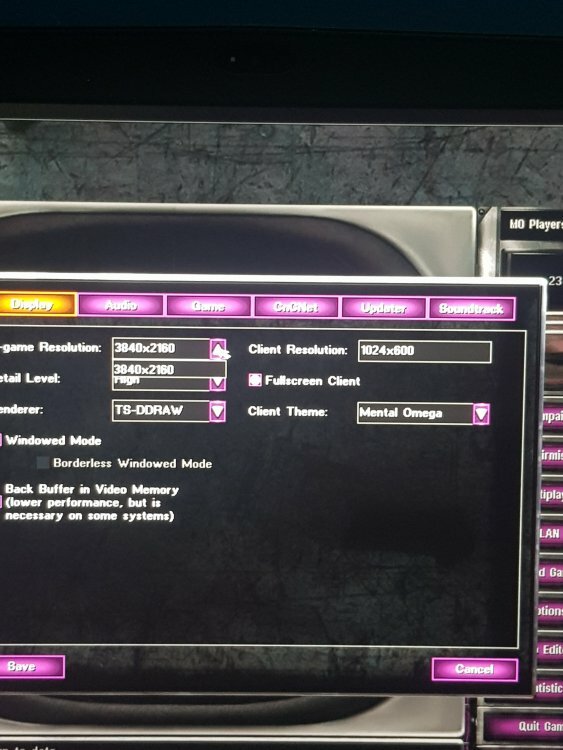 I have problem with C&Cnet client using mods all force native screen resolution witch is 3840x2160 and i cant change it since it reverts manual change in ini file back to native and only way i can use custom screen resolution is by making ini read only. I add pictures of my problem i only hope that there is a way to fix this. This might be a permissions issue. Have you tried running the client as admin? Yes i have but no change. I updated drivers plus reinstalled thous as well still no change. Are you using a virtual machine? Sorry but no. I play thous on main machine still i have no clue how this happened exepct os is windows 10 so i guess updates mess up things or something and no help form their part either. Because of this mess i cant play mp mod with my friends since native screen resulution makes thing tiny no joke. But if theres a way to force client to run in choosen resulution with ini edit then no problem since this can be made read only but where. Done tryed no errors, no drive bugs either. Plus i keep every thing up to date to avoid problems in the first place. It is like some is trying to kill life support of good old game with updates. No way to fix even old drives wont bring back screen resulution options any more it worked on my old laptop but not any more. Windows 10 is latest build. you did an sfc scan in 4 minutes? Do you have all the resolutions when you launch clientogl.exe? For some od reason that has but main exe to launch mod or other mods doesnt have it curious. Any ideas how this is possible just wondering since i didnt know about this exe at all. clientogl.exe uses OpenGL for the backend. By default the client launches clientdx.exe which is using DirectX. How to make switch to launch with this openGL exe since other wise i am stuck with directX one and read only ini. Plus another problem with this clientogl.exe is that no sound. Just make a shortcut to clientogl.exe or change the shortcut that you normally use. 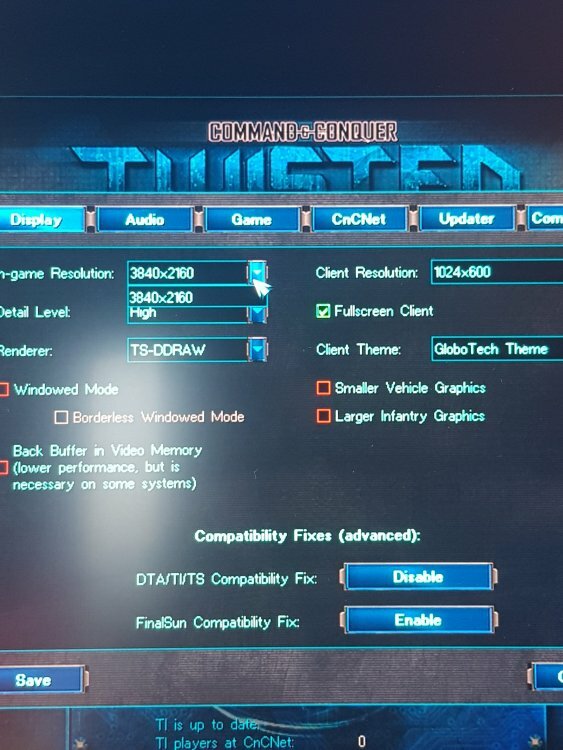 Ok thanks temporary fix until theres real fix for this in windows 10 or who knows what causes that problem that programs cant switch betvene direcX and openGL. Looking for testers for a new release of TS-DDraw. Should work for Tiberian Sun, Red Alert 2 and Yuri's Revenge. NOTE: THIS IS TESTED AND WILL WORK ON CNCNET ONLY. SKILLS IN MAP FILE EDITING AND TRIGGER AND MODDING KNOWLEDGE IS REQUIRED. This map are 2 more with these are in the attachments below. Note that these still have the testing 100$ per 10 seconds, and lots of power. in This tutorial on the other hand, reduced to $85 and little power. THIS IS 1 SINGLE OIL DERRICK! DOWNLOAD OILDERRICK.RAR FOR 1,2,4 AND 8 OIL DERRICKS! [b]; If you already have triggers, Just copy paste the content under Tags, Events, Triggers, and Actions below your existing ones. ; This content includes [Houses], make sure you don't double copy it[/b] [Triggers] 01L10002=Neutral,01L10020,attach to Oilderrick#1,0,1,1,1,0 01L10004=Spawn1,<none>,Oilderrick#1 - spawn1,1,1,1,1,0 01L10006=Spawn2,<none>,Oilderrick#1 - spawn2,1,1,1,1,0 01L10008=Spawn3,<none>,Oilderrick#1 - spawn3,1,1,1,1,0 01L10010=Spawn4,<none>,Oilderrick#1 - spawn4,1,1,1,1,0 01L10012=Spawn5,<none>,Oilderrick#1 - spawn5,1,1,1,1,0 01L10014=Spawn7,<none>,Oilderrick#1 - spawn7,1,1,1,1,0 01L10016=Spawn6,<none>,Oilderrick#1 - spawn6,1,1,1,1,0 01L10018=Spawn8,<none>,Oilderrick#1 - spawn8,1,1,1,1,0 01L10020=Neutral,01L10022,Oilderrick#1 Captured by 2 ,0,1,1,1,0 01L10022=Neutral,01L10024,Oilderrick#1 Captured by 3 ,0,1,1,1,0 01L10024=Neutral,01L10026,Oilderrick#1 Captured by 4 ,0,1,1,1,0 01L10026=Neutral,01L10028,Oilderrick#1 Captured by 5 ,0,1,1,1,0 01L10028=Neutral,01L10030,Oilderrick#1 Captured by 6 ,0,1,1,1,0 01L10030=Neutral,01L10032,Oilderrick#1 Captured by 7 ,0,1,1,1,0 01L10032=Neutral,01L10162,Oilderrick#1 Captured by 8 ,0,1,1,1,0 [Actions] 01L10002=9,14,0,50,0,0,0,0,A,53,2,01L10004,0,0,0,0,A,54,2,01L10006,0,0,0,0,A,54,2,01L10008,0,0,0,0,A,54,2,01L10010,0,0,0,0,A,54,2,01L10012,0,0,0,0,A,54,2,01L10016,0,0,0,0,A,54,2,01L10014,0,0,0,0,A,54,2,01L10018,0,0,0,0,A 01L10004=1,106,0,50,85,0,0,0,A 01L10006=1,106,0,51,85,0,0,0,A 01L10008=1,106,0,52,85,0,0,0,A 01L10010=1,106,0,53,85,0,0,0,A 01L10012=1,106,0,54,85,0,0,0,A 01L10014=1,106,0,56,85,0,0,0,A 01L10016=1,106,0,55,85,0,0,0,A 01L10018=1,106,0,57,85,0,0,0,A 01L10020=9,14,0,51,0,0,0,0,A,53,2,01L10006,0,0,0,0,A,54,2,01L10004,0,0,0,0,A,54,2,01L10008,0,0,0,0,A,54,2,01L10010,0,0,0,0,A,54,2,01L10012,0,0,0,0,A,54,2,01L10016,0,0,0,0,A,54,2,01L10014,0,0,0,0,A,54,2,01L10018,0,0,0,0,A 01L10022=9,14,0,52,0,0,0,0,A,53,2,01L10008,0,0,0,0,A,54,2,01L10006,0,0,0,0,A,54,2,01L10004,0,0,0,0,A,54,2,01L10010,0,0,0,0,A,54,2,01L10012,0,0,0,0,A,54,2,01L10016,0,0,0,0,A,54,2,01L10014,0,0,0,0,A,54,2,01L10018,0,0,0,0,A 01L10024=9,14,0,53,0,0,0,0,A,53,2,01L10010,0,0,0,0,A,54,2,01L10006,0,0,0,0,A,54,2,01L10008,0,0,0,0,A,54,2,01L10004,0,0,0,0,A,54,2,01L10012,0,0,0,0,A,54,2,01L10016,0,0,0,0,A,54,2,01L10014,0,0,0,0,A,54,2,01L10018,0,0,0,0,A 01L10026=9,14,0,54,0,0,0,0,A,53,2,01L10012,0,0,0,0,A,54,2,01L10006,0,0,0,0,A,54,2,01L10008,0,0,0,0,A,54,2,01L10010,0,0,0,0,A,54,2,01L10004,0,0,0,0,A,54,2,01L10016,0,0,0,0,A,54,2,01L10014,0,0,0,0,A,54,2,01L10018,0,0,0,0,A 01L10028=9,14,0,55,0,0,0,0,A,53,2,01L10016,0,0,0,0,A,54,2,01L10006,0,0,0,0,A,54,2,01L10008,0,0,0,0,A,54,2,01L10010,0,0,0,0,A,54,2,01L10012,0,0,0,0,A,54,2,01L10004,0,0,0,0,A,54,2,01L10014,0,0,0,0,A,54,2,01L10018,0,0,0,0,A 01L10030=9,14,0,56,0,0,0,0,A,53,2,01L10014,0,0,0,0,A,54,2,01L10006,0,0,0,0,A,54,2,01L10008,0,0,0,0,A,54,2,01L10010,0,0,0,0,A,54,2,01L10012,0,0,0,0,A,54,2,01L10016,0,0,0,0,A,54,2,01L10004,0,0,0,0,A,54,2,01L10018,0,0,0,0,A 01L10032=9,14,0,57,0,0,0,0,A,53,2,01L10018,0,0,0,0,A,54,2,01L10006,0,0,0,0,A,54,2,01L10008,0,0,0,0,A,54,2,01L10010,0,0,0,0,A,54,2,01L10012,0,0,0,0,A,54,2,01L10016,0,0,0,0,A,54,2,01L10014,0,0,0,0,A,54,2,01L10004,0,0,0,0,A [Events] 01L10002=1,1,0,50 01L10004=1,13,0,10 01L10006=1,13,0,10 01L10008=1,13,0,10 01L10010=1,13,0,10 01L10012=1,13,0,10 01L10014=1,13,0,10 01L10016=1,13,0,10 01L10018=1,13,0,10 01L10020=1,1,0,51 01L10022=1,1,0,52 01L10024=1,1,0,53 01L10026=1,1,0,54 01L10028=1,1,0,55 01L10030=1,1,0,56 01L10032=1,1,0,57 [Tags] 01L10003=2,ATTACH TO OILDERRICK #1 1,01L10002 01L10005=2,Oilderrick#1 - spawn1 1,01L10004 01L10007=2,Oilderrick#1 - spawn2 1,01L10006 01L10009=2,Oilderrick#1 - spawn3 1,01L10008 01L10011=2,Oilderrick#1 - spawn4 1,01L10010 01L10013=2,Oilderrick#1 - spawn5 1,01L10012 01L10015=2,Oilderrick#1 - spawn7 1,01L10014 01L10017=2,Oilderrick#1 - spawn6 1,01L10016 01L10019=2,Oilderrick#1 - spawn8 1,01L10018 [Houses] 0=GDI 1=Nod 2=Neutral 3=Special 50=Spawn1 51=Spawn2 52=Spawn3 53=Spawn4 54=Spawn5 55=Spawn6 56=Spawn7 57=Spawn8 Save, Open Final Sun and Attach #Oilderrick1 to your oilderrick building! 106=Give Credits...,0,2,5,0,0,0,0,0,0,Give credits to a specific house.,1,0,106 Make this change and save if its not there. The triggers have been created with Final sun's, under Edit> trigger editor (with disabled beginner mode under Options), using 8 repeating triggers with events "Entered by" with spawn1 as parameter in the first triggers, spawn2 in the next, etc. all with Action "enable trigger", enabling each their own Trigger, the "give credits" loop, and also 7 disable all other houses credits loop. So the give credits loop need another 8 repeating triggers, Using event Time elapse, and action give credits. Make sure you have all the triggers options owner set to Neutral and repeating. Then you attach the "entered by spawn1" to your oil derricks, and in that same trigger's options attach the"entered by spawn2" trigger, and in that trigger attach spawn3, etc. You can download one of the maps i attached here, to check it out yourself and see how the trigger's work. Using 2 different editor on the same file could delete your work. So Always make sure you Reload the file Each time you made an edit. Using a software like notepad++ will always ask you to reload it, Final sun does NOT. 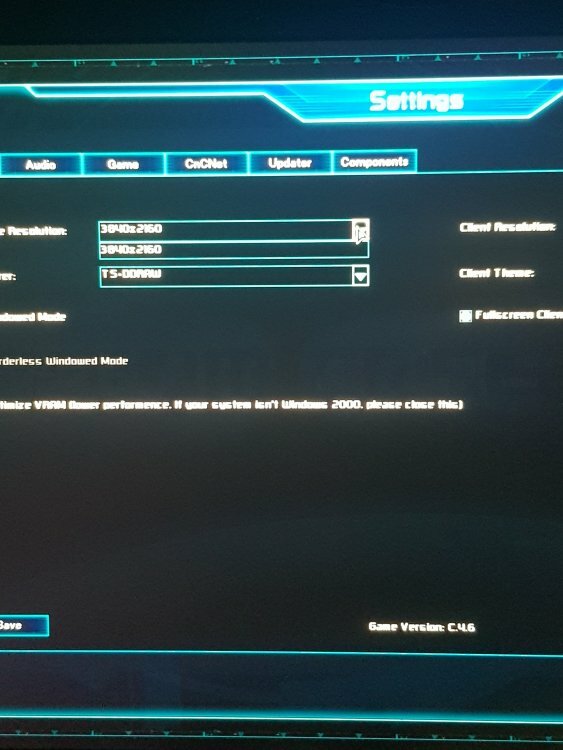 If this will crash its possible that the client you're using isn't up to date, for this is tested and working in CnCnet. Using triggers can always crash untested, and so its smart to test every little thing first. Or ever smarter, get a coach that knows alot about final sun. Me, Ptapiok, Humble, Skylegend, and many others don't mind helping you on on the discord sever https://discord.gg/CMMVFYk if you have any trouble what so ever. OTHER THEN ALL OF THAT, COPYING ALL CODES UNDER [Tags],[Triggers],[Actions],[Events] will most likely work (on CnCnet for sure). Just updated to latest release, haven't changed any settings on the machine and can no longer play. Games starts then as soon as I start to try to play everything locks up. EDIT: If I set game to CnC Draw it works, DDwrapper no longer works.